This spicy bowl is balanced out by cool veggies and herbs. 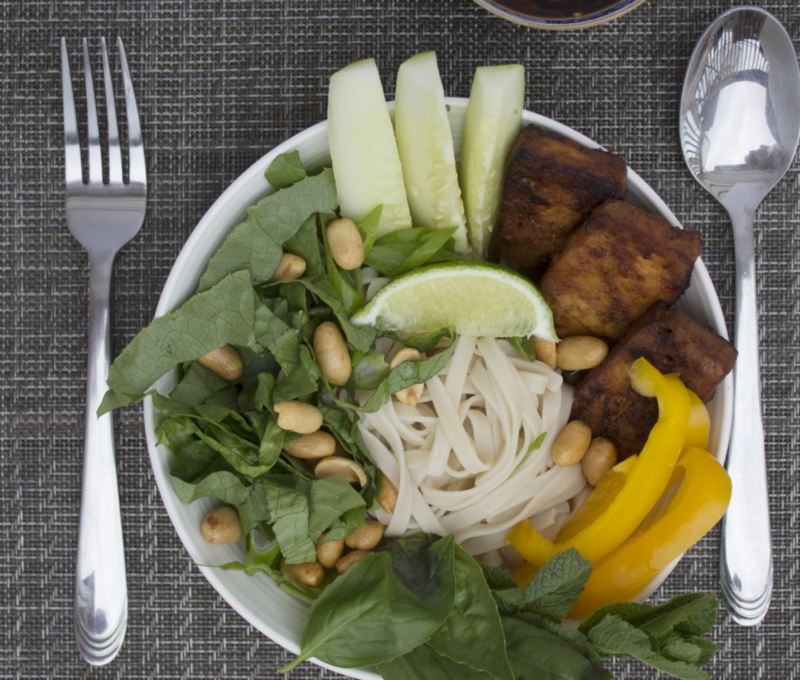 Make a scrumptious meal in a single bowl by blending rice noodles with several enticing ingredients. This recipe originally appeared in the OptiMYz 905’s Healthful Gourmet, 3 bowls full by Grace Szucs. Wrap tofu in a clean tea towel or paper towel and place under a heavy weight for 30 minutes. A few big cookbooks work well for this. Squeezing out the liquid will make the tofu firmer and allow it to soak up the marinade. Prepare the marinade by mixing the ingredients together in a bowl. Slice tofu into ½ inch slabs and cover with marinade for one hour. Preheat oven to 375°F and place a sheet of parchment paper on a baking sheet. Lay out the marinated tofu slabs and bake for 30 to 40 minutes, flipping them over halfway through. Set aside. Prepare the dipping sauce by smashing the ginger and garlic into a paste using a mortar and pestle or a small food processor. Combine with the rest of the ingredients and set aside. Cook rice noodles according to the package. As soon as the noodles are cooked, drain and rinse under hot water to remove excess starch. Place in a bowl with tofu, lettuce, pepper and cucumber. Garnish with peanuts, mint and basil. You can dip your noodles in the sauce as you go, or add it to the bowl.